"You know you secretly love feeling miserable because of the tragic lives of fictional characters." I so want to steal that quote! (but I will credit you, so it's not really stealing, is it?) There's something compelling about tragedy. I don't know if it's so much that we love to feel miserable, or if we just love to feel. I've heard great things about Green, but I haven't read any of his work yet. Saw this in the library some months back but didn't grab it, because I guess I had too many other things I wanted to read first. It hasn't been back since. Lol I would be flattered, but perhaps you're right, it's that we love to feel. Maybe we feel sad easier than we feel happy, or maybe we're so used to feeling happy that we like the change of feeling sad. Thoughts? 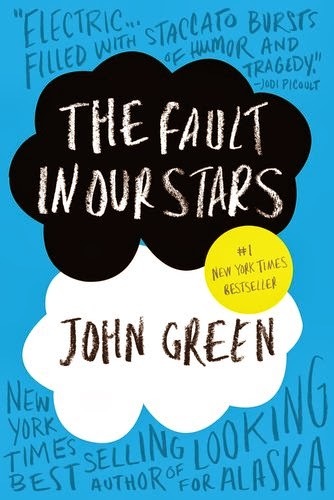 The moment I saw the name John Green, I knew that I heard it somewhere. After googling I found the answer. He wrote LOOKING FOR ALASKA and a young woman who read the first parts of the my second novel was raving about this book. I read parts of it. But I like that John Green is able to get into the mind of a teenage girl. I should read these parts and maybe can apply it to my novel. But I don't like reading sad stories about cancer.